Most of the C&NW's principal depots were designed by Charles S. Frost, a Chicago architect. Most of the C&NW depots followed a similar design, with a ladies waiting area and a mens waiting area that was also set aside for smoking. Today, the smoking area is a board room. The ladies waiting area is on the southeast end of the depot, near the ladies rest room. There is a large quilt hanging there that old timers in town remember was the place of a large clock. The old timers also report it had to be wound daily. Later, the two rooms became a waiting area for departing passengers and the other for inbound passengers. The platform area was usually an elevated concrete slab, here it is comprised of brick pavers. The station manager's office was also similar in most C&NW depots with a bay window overlooking the track side and a large ticket window. A signal standard, missing from this depot, was usually outside the bay window. This track was the route of C&NW's signature passenger train, the crack "400" so named for covering the distance between Chicago and St. Paul in 400 minutes, including 7 stops along the way. 400 service began in 1936, the C&NW's answer to competitor's crack passenger service between the two hubs. The Chicago, Burlington & Quincy had the "Zephyr" and the Milwaukee Road had its famous Hiawatha. There is mixed and conflicting data in the history of the Chicago & Northwestern 400. Most sources agree that C&NW didn't initially have equipment to compete with CB&Q and Milwaukee Road, and modified two extant Pacific (4-6-2) locomotives for high speed service. Another source says C&NW ordered four Hudson (4-6-4) locomotives from Alco in 1937 to pull the 400. The Hudsons were set up for speed with 84" drivers and clad with streamlining. The cladding was painted in C&NW's green & yellow colors to match the passenger cars. Beginning in 1939, the C&NW used EMD E2A (perhaps E3A) diesels beginning in 1939. The two A units ran back to back to make turnaround for the return trip much easier. 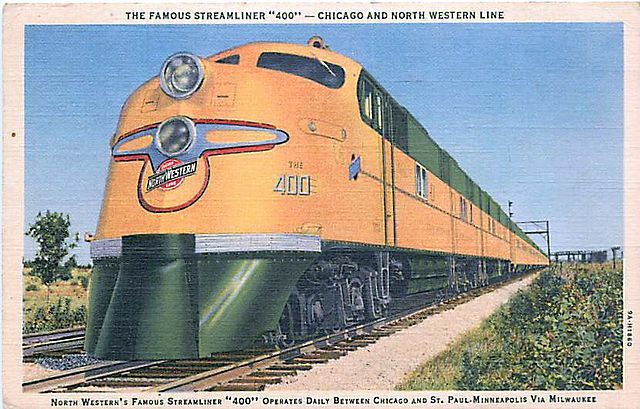 The 400 was successful for the C&NW, in fact, the "400" moniker was successful enough that the train was soon renamed the "Twin Cites 400" and other passenger trains had "400" added to the names, such as "Flambeau 400," "Dakota 400," "Valley 400" and even the "Kate Shelly 400" in honor of Iowa's heroine. The depot in Reedsburg looks very much like it did when it was serving the eye-catching green & yellow passenger trains. The last "Twin Cities 400" rumbled past on July 23, 1963. Judging from the rust on the rails and the fact the track ends at Walnut Street, it's probably safe to say that it has been a long time since this depot saw trains of any kind. Today, the depot serves as the headquarters for the 400 State Trail, a recreational trail that runs 22.3 miles from this location to Elroy where it connects to the famous Elroy-Sparta trail, that continues along the former route of the Twin Cities 400. The trail only runs northwest, southeast of the depot, the old C&NW track is still in use by the Wisconsin & Southern Railroad.